Yang Ermin was born in 1964 in Quyang County, Hebei Province, P.R. China. He studied art since he was a child. His doctor’s degree in aesthetics he got at Nanjing University of the Arts. He was mainly working with the ancient Chinese technique of ink-and-wash.
After his long-time exploration, he developed a new form of ink-and-wash painting based on traditional Chinese painting material combined with modern elements. Rice paper that is used in Chinese traditional painting, is not able to carry thick layers of oil paint, and it is much more delicate than canvas, and much less absorbent, so it is more likely to be torn or smudged when painted with oil colors, and therefore the use of oil on this paper would be very difficult. Beside this fact, Yang didn’t appreciate other techniques that much. “I tried oils, yes, but acrylic and watercolor just don’t achieve the same feeling as ink,” Yang says. Traditional Chinese painting has not became very popular in the global art world, mainly because it was always centered on using various densities of black ink for depicting light and dark. Yang’s innovation came with adding splashes of bright color to traditional ink-and-wash paintings. With his new technique, he paved the way that others could follow. The way that leads to the future of Chinese painting. With his new technique, he used colors in a way that makes them look conciliatory and not contradictory. “That’s what ink-and-wash is good at. It is hazy and implicit. We don’t want to lose any of our traditional Chinese flavor, like the gentle outlines of oriental faces and figures, or the faint aroma of tea”, he says. His thoughts of how ancient Chinese culture could be better shared with everyone had much with the technique he developed. “I was so bored with some of the lifeless stereotypes that were being used. I was miserable,” Yang says of his earlier days. “People were still drawing the same things that painters drew in the 18th or 19th century. They were drowned in tradition. But art should never be allowed to lag behind society,” Yang adds. Being frustrated with the situation in the art world in China, he embraced the avant-garde New Wave Movement that flourished in China between 1985 and 1989. This movement was the beginning of reinventing Chinese art, which was under the heavy influence of politics throughout the decades of political turmoil. Li Xiaoshan, an art theorist and critic of the time, wrote at the time of how in his opinion most of the traditional Chinese practices had effectively died. In the work he called, View of contemporary ink-and-wash painting, he described how enormously disturbing is that going to be to modern art. Although Yang moved to Japan 20 years ago, he is spending much time in U.S. For the past two decades he held exhibitions all over the world, and got in touch with many artists. “Artists overseas tell me they envy me as everything I do is still very closely related to traditional Chinese style, while they themselves feel isolated from their own artistic traditions,” says Yang. “I take this as a real compliment.” In China, though, many art critics think that Yang’s work took much of the Western style. For his work Yang received many awards, some of which are, Excellence Award of National Painting Exhibition at 60th Anniversary of Foundation of PLA, Beijing, China in 1989, Special Award of Turin International Art Exhibition, Turin, Italy, in 1996, Excellence Award of Tokyo Kinsa Painting Exhibition, Tokyo, Japan in 1997. 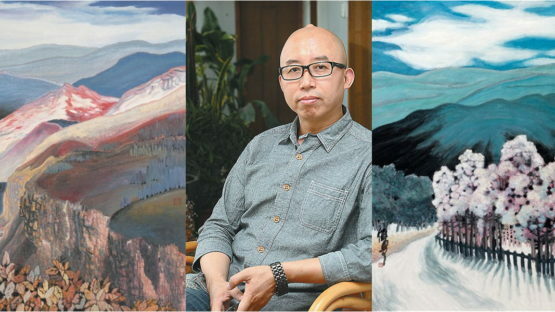 In 2003, Contribution Award of the 1st Columbia World Painting Exhibition, Columbia, U.S.A., 2005, Fubaoshi Award, a nomination award by the Organizing Committee of the Three-year Exhibition of Ink and Wash Paintings in Nanjing, China, and in 2007, Saint Said Contemporary Art Award, South Colorado, U.S.A.
On his work there were a few publications over the years. Yang Ermin’s Paintings (1992-1999), published by, National Art Museum of China, Beijng, Combination of Eastern and Western Arts: Yang Ermin and His Art, English Version, U.S.A., Selected Ink and Wash Paintings by Yang Ermin, Gallery at Beijing International Arts Center, China Gallery Publishing House, Beijing, A Famous Contemporary Chinese Artist: Yang Ermin and his World of Ink and Wash Paintings, Sichuan Fine Arts Publishing House, Chengdu, Yang Ermin: An Explorer of New Ink and Wash Painting (Japanese Version), Japan, A Great Master Artist of Chinese Painting: Yang Ermin and Present-day Chinese Painting, Sichuan Fine Arts Publishing House, Chengdu. His works are held by various institutions all over the world. They can be seen at, National Art Museum of China, China, Guan Shanyue Art Museum, China, Huang Zhou Art Foundation, China, Saint Said Art Center, U.S.A., Pasco Art Center, U.S.A., Honda Museum, Japan, Kasuga Art Museum, Japan, Art Museum, France, Art Museum, Holland and Museum of Modern, Turkey. Yang Ermin is presently working as Editor-in-chief of ArtsBj.com, director of Chinese New Ink and Wash Painting Institute, Chief Researcher at Toyo Fine Arts Institute, Japan, visiting research fellow at Saint Said Art Center, U.S.A. and visiting professor at Hebei University, China.